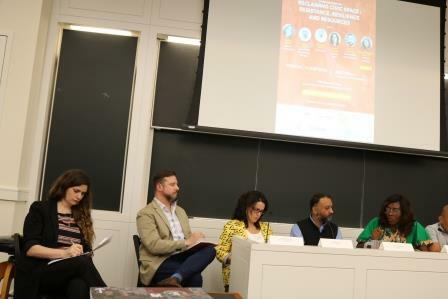 SPACES FOR CHANGE’s director, Victoria Ibezim-Ohaeri, joined activists from Argentina, United States, Brazil, Philippines and India at a panel discussion on Reclaiming Civic Space: Resistance, Resilience and Resources held at New York University (NYU) on May 21, 2018. The panelists at the discussion are contributing authors to the 26th edition of the Sur International Journal on Human Rights (SUR 26), published by Conectas Human Rights in collaboration with The Fund for Global Human Rights. Deborah Alejandra Popowski of the Center for Human Rights and Global Justice, NYU School of Law moderated the panel discussion. SUR 26, a special edition of the SUR journal documented the resistance of human rights groups during a time of increasing repression and restrictions on civil society, and offers key insights on the strategies frontline activists are using to reclaim civic space. The panel started with a discussion of the drivers of governmental restrictions on free speech, association and assembly rights, resulting in growing repression and crackdowns on the civil society across continents. From Africa to Asia to Latin America, one thing is clear: governments do not like dissent. As such, they are determined to take the most-stringent measures to suppress dissent or any act of institutionalized challenge to the status quo. Because civil society groups and activists are the primary actors initiating a variety of bold actions to expose official corruption and challenge injustices, they are often the targets of governmental restrictions. In many jurisdictions, civil society organizations and other non-profit entities that receive foreign funding are accused of engaging in terrorism. Accordingly, governmental measures often adopted to combat money laundering and counter financing of terrorism provide justification to cut off funding to organizations critical of government decisions, shrinking the civic space. Such attacks on activists and the civil society framed around the objective of national security and national interest clothe these official actions with legitimacy, creating an atmosphere of fear and insecurity while tightening the space for democratic engagement even further. Discussing the strategies to resist the tide of legal and regulatory restrictions to civil society, Ms. Ohaeri explained that proposals designed to shrink the civic space are not always explicitly evident. Legislative proposals that contain restrictive provisions often bear confusing titles (e.g. “Frivolous Petitions Bill” was the title for the anti-social media bill), and the injurious content is only detectable through constant vigilance and policy analysis. Restrictive regulations could manifest in a variety of forms, not necessarily in the custom of legal regimes. For instance, restrictive regulations may be inserted into ministerial regulations, codes of corporate governance or internal policy directives, all of which have the possibility of obstructing civic engagement. The public usually becomes aware only once the directives or regulations have become operative. The only recourse available to affected groups is either social pressure, or a judicial review to try and invalidate the regulations or directives. These forms of legal and non-legal restrictions are more difficult to notice and counter. Despite the overbearing exercise of governmental power, activists are pushing back using a variety of strategies. Ms. Ohaeri discussed some of the strategies SPACES FOR CHANGE has been using to confront closing spaces in Nigeria. The first part is through robust research action and analysis of legislative proposals. Thanks to the advancements in digital technology, messages now travel faster, across greater distances, especially through the use of social networks, such as Facebook, Twitter, and YouTube. With the speed of dissemination that these social networks offer, public pressure may be activated and amplified with limited resources. Research information can be technical and boring at times. To simplify the data and disseminate research information to a wide range of audiences, SPACES FOR CHANGE leverages on the social media, including collaborating with bloggers to relay messages. Thanks to their strong online presence and huge following, bloggers typically command the traffic needed to disseminate information to wider audiences. Blogging about technical issues enables data to be presented using non-technical language that most people can connect with. It also gives researchers the freedom to humanise difficult research questions around the threats to civic spaces and crowdsource responses from a wide spectrum of stakeholders. The other activists from the Philippines and India talked about how HIV and LGBTI rights advocates have long grappled with constricted civic space in Philippines. They also discussed the issue of fickle donor priorities and donor deference to governments – which has greatest impact on smallest organisations, allowing large international organizations (INGOs) to thrive. These issues stirred a robust debate discussion on the question of legitimacy, accountability vs accounts-ability of non-governmental bodies in context of resilience. A lively discussion followed next with questions, comments and contributions from participants about the various issues raised during the panel discussion. Conectas and The Fund—in partnership with ESCR-Net – International Network on Economic, Social and Cultural Rights and NYU School of Law’s Center for Human Rights and Global Justice and Robert L. Bernstein Institute for Human Rights—hosted the panel discussion with the aim of sharing the knowledge captured by the Journal with an audience of scholars, activists, and practitioners.